Time to move! Taking time for activity throughout the day can improve your child's attention, focus, and performance. In this worksheet, Floyd demonstrates the Cow Pose. Kids can colour in the picture, and practise this yoga pose along with him. In this worksheet, Roly demonstrates the Mountain Pose. Kids can colour in the picture, and practise this yoga pose along with him. 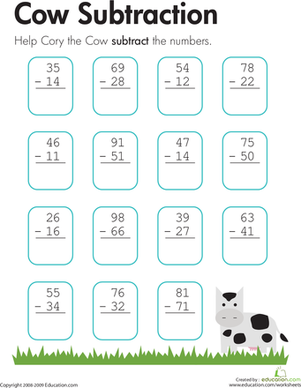 On this year three maths worksheet, kids help Cory the Cow by solving subtraction problems with two-digit numbers and no regrouping. The the kind of cow pie you'd expect! Introduce kids to figurative language with these fun coloring sheets featuring literal depictions of common animal idioms. Would you like to take a ride on the enormous Steller's sea cow? colour in the ocean dweller and his watery surroundings as you learn about the extinct sea cow.